The classic game of fantasy football in the world of Warhammer. Blood Bowl. A Games Workshop classic loved and enjoyed by many, fantasy football at its finest. Criminally undersupported by Games Workshop by many years, in 2016 it was finally re-released, the herald of what was to become a new generation of ‘specialist’ boxed games and a new age for the company. 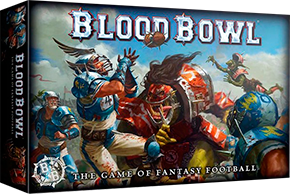 Blood Bowl is a hoot and fun to play, despite the somewhat dated rules, and there have been some fantastic new teams released—I’m especially fond of Nurgle’s Rotters! Nice summary, well done! Check out thenaf.net for all about BB! Any idea if this sheet is applicable to the 2016 re-release? I haven’t seen the rules for the new version so I can’t confirm either way. Very little changed outside of campaign rules (which aren’t covered by this summary). As far as I can see, nothing in here is out of date.